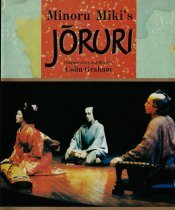 We are delighted to be able to share about two and a half minutes of Jōruri, an opera by Minoru Miki. Joseph Rescigno conducted the world premiere and Japanese premiere, and the latter was recorded live and released on video cassette and laser disk by Dreamlife Corporation. This excerpt features Nanae Yoshimura on the koto. ©1985, ZEN-ON Music Company Ltd.
As you can see, our original mp2 files are smaller than the successor mp3 files. Most media players that will play mp3 files will also play the older filesbut not quite all. The RealAudio file is engineered for a 56 Kbps modem. If you get breaks in the sound, click on the RealAudio download rather than the stream.